It's your complete Football Delight. Must for a true Football fan!! The best App. So far as sports is concern. 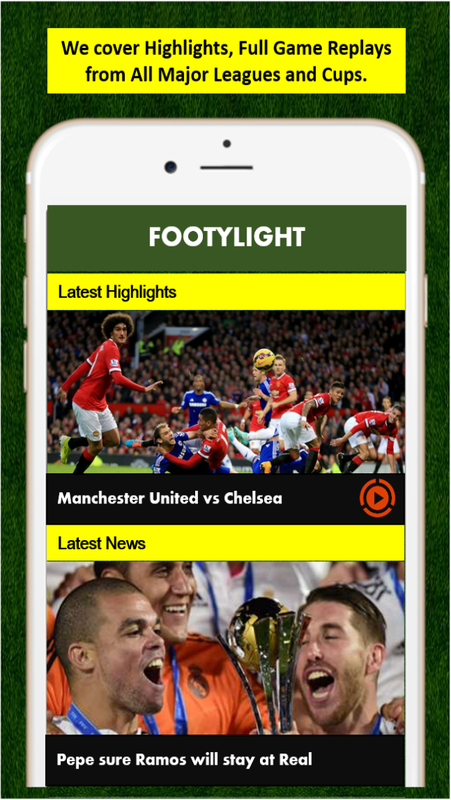 This App has all the goals/highlights of interesting games of major leagues and international competitions. Since I can't watch all the games, this App provide an excellent alternative that I can project on tv with Apple TV. Who needs cable or satellite tv?! This is the best ever app I have fallen in love with. It gives me update on all my local and international soccer scores and news. The highlights and the best in terms of quality pictures. The only thing I would say about it is some of the commentary are not in English and that's about all. It gives me scores of all soccer high lights around the world. Perfect App for me. Just amazing - has everything you could ask for and more. Great quality highlights right at your fingertips. Immense - This App is incredible! Almost too good to be true. All the football highlights you need in HD!! I hope they keep it this way! Loving it! Thank you Footylight team! Now I won't miss a thing!